Animals always played an important role in the myths of the Incas and especially the Snake, the Puma and the Condor. They represent the underworld, the world of men and the upper world. These animals are wonderfully processed in and around the Sacred City. 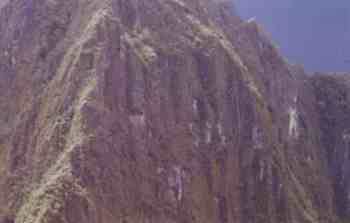 The Huayna Picchu has the natural shape of a Puma. The architects built small high terraces on the summit to give the impression that the hair of the puma stands up straight. The eyes are cut out; the mouth and the form of the head have a natural origin. 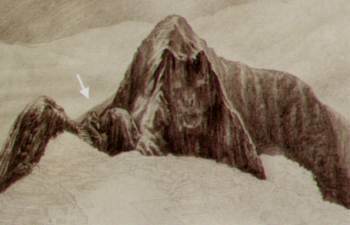 The drawing shows clearly the Puma guarding the Sacred City. The white line points to a young bird stretching its wings. Remarkable that Huayna Picchu means "Young Mountain" in Quechua and Huayna Pichiu "Young Bird". It must be obvious by now that the Incas didn't choose this place by coincidence. They planned the building of their most beautiful sanctuary according to the natural elements surrounding the place and the ideology of their cosmic vision. When the Incas realized how special this place is, they started the building of the city itself. A huge titan work was waiting for the architects, workers, astronomers and priests to apply the natural elements into a magnificent whole. The first thing to do was clearing the tropical rainforest. The steep terraces around the city prove the difficulty of building the complex. The shape of the whole place where the city is built is also special: the form of a huge condor, flying up to visit the Milky Way, the Way of all Beginning. The caiman place an important role in the history of the Incas and all ancient cultures of Latin America. They maybe thought that the caiman is the oldest living animal on this world, the creature that has always existed on the earth of the Pachamama. Or maybe because the caiman is the biggest of all crocodiles and master over the rivers in the jungle. 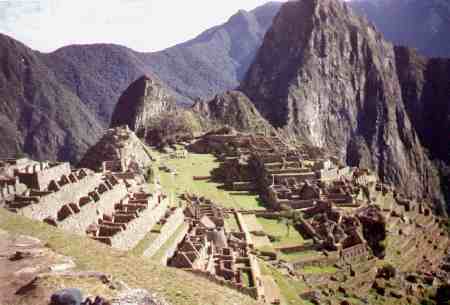 The Urin-sector of Machu Picchu is the sector dedicated to Inca Amaru Tupac. This is the complex where the caiman is shaped out. 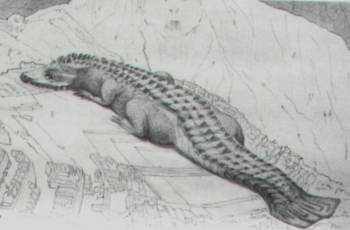 The peculiar composition of this sector gives the impression as the caiman climbed out of the Vilcanota River to the top of the mountain. The caiman gives us the illusion of being in movement. On the drawing above the caiman is clearly recognizable. 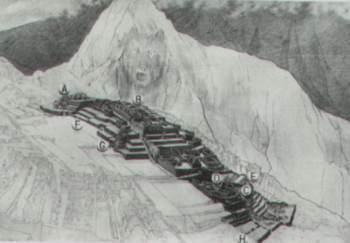 Hiram Bingham already recognized this part of Machu Picchu as the section where the labor was expressed (in the body of the caiman) and as the military zone (head). look at it its cool!!!!! !